One reviewer called Boku Dracula-Kun "Castlevania for kids". That describes it exactly. It's a well-made game which went under the radar everywhere except Japan for a long time. This is Kid Dracula more or less, based on the watered-down Game Boy version released around the same time. 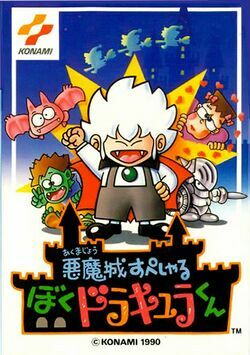 Boku Dracula-kun itself is based on Castlevania, or it seems like more of a parody, which should be very noticeable when you see its cartoon-like renditions of many well known enemies. The music and graphics are also lighter and much less gloomy and dark. Note that you need to know a little Japanese to be able to play this game. A complete translation patch is also available. This page was last edited on 9 June 2012, at 10:35.